Stand For Children Or Stand For Corporations? Thousands of people attended a February 2009 rally on the capitol steps in Salem organized by Stand for Children. The Portland group faces heavy criticism for comments by its leader and for changes that have alienated longtime volunteers. Portland’s nonprofit Stand for Children, an education advocacy group with chapters in nine states, is under fire by critics this week after a video and blog post raised questions about the organization’s direction and leadership. A now-viral video of Stand cofounder Jonah Edelman, the Portland son of national civil rights activist Marian Wright Edelman and leader of the group, was recorded at a public forum in Aspen, Colo., describing how he out-politicked a teachers’ union to get a piece of education reform legislation adopted by the Illinois Legislature. The three unions involved, in Illinois and Chicago, issued statements of “disappointment” and Edelman quickly apologized for the comments. But the tussle opened a floodgate of scrutiny and criticism by disaffected Stand for Children volunteers, including Portland parent Susan Barrett, who wrote a critical Internet post that was published Thursday, July 14, in The Washington Post. 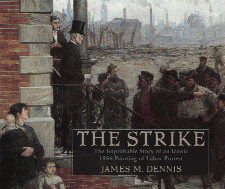 Published in April, James Dennis’ new biography of a painting, The Strike, explores in a marvelous way the confluence of art and labor. Robert Koehler’s The Strike is the book title. Click the link to read more. The Triangle Shirtwaist Factory Fire is one of the most recognized events in working class history. The facts are literally burned into the historical memory. JoAnn Argersinger, David von Drehle and Leon Stein have all written important contemporary studies of the fire and its aftermath. Charred beyond recognition, many of the victims were identified by family and friends only by trinkets they were wearing or some unmarred physical feature. Some remained unidentified until the last decade. Just last year, the New York Times reported that the remains of the last three of those killed in the fire have finally been identified. The fire took place on Saturday, March 21, 1911, at quitting time. It was all over in less than 30 minutes. 146 workers died in that fire, asphyxiated due to smoke inhalation, burned to death, or, in desperation, leaped to their death from the 8th floor. This was the largest number of workers killed in New York in one workplace incident until Sept 11, 2001. In this 100th anniversary year of the fire, commemorations have been held all around the country. From the time of the event the story has been explored in poetry, fiction, biography and history. The story of the fire, it is argued, galvanized a social movement in New York City, New York State, and ultimately nationally. Frances Perkins, born into a business owning family, and educated in chemistry, physics and political science, was head of the New York Consumer’s League when she witnessed the fire itself, agitated for workplace reform, influenced New York State social policy and legislation for the next two decades, until she was chosen by FDR as his Secretary of Labor. (As a side note, despite her proven advocacy of issues important to the working class, the American Federation of Labor was enraged that Roosevelt chose her over their favored candidate, Teamster Union head Dan Tobin). The event itself is an ambiguous event. The tragedy invites the writer to focus on a story of victims, of objects caught in the grasp of an unrelenting system. How you view the fire colors how you view the working class itself. Do we concentrate on the 146 victims, the death and senseless destruction. Do we look at the heroism of those who led the 1909 Triangle strike and those who led the battle to fight for workers rights after the fire? Do we celebrate the political leaders who accomplished the reforms that were inspired by the tragedy? Who are the heroes? Frances Perkins gets a lot of credit, but what about the collective working class leaders on plant floors, in the communities? There is nothing new in the thesis that working class literature mirrors or describes or reflects work and working class life. But what is “working class life,” and how does art transcend the description of daily drudgery? What can art that refers to the century old Triangle Fire tell us about working class life under the distinctly different conditions of today? Of the wealth of literature on the fire, this essay concentrates on the novels Rivington Street (Meredith Tax) and Triangle (Katharine Weber) and on the poetry published in the 100th anniversary anthology, Walking through A River of Fire (Julia Stein). (For a more complete list of poetry and fiction on the fire, see https://chilaborarts.wordpress.com/2010/07/25/2019/. There are also a number of children’s books published about Triangle). In Rivington Street (and its sequel, Union Square) Meredith Tax plays close attention to historical detail. She begins in the Bohemian ghetto on the border of Rumania and the Ukraine, a town called Kishinev. She begins with a Jewish family, scarred by the infamous pogrom of 1903. Hannah, the mother has scraped up scarce resources in hopes of escaping to America. Hannah hides – buries – the money from her family; she is almost a frightened appendage to Moyshe, her self-confident, socialist Zionist, revolutionary husband. He senses a pogrom coming and tries to warn the Jewish citizens to prepare for the armed suppression he expects. He urges them to arm themselves in self defense. Hannah recognizes in her own way that her family has no protection in the ghetto – there is word of pogroms everywhere. They have had to move once before themselves (Moyshe is an assumed name, an identity taken to keep him from being picked up by the political police) – and so she hides bits of money in the determination to accumulate enough for the whole family to come to America. The family goes hungry for years for her to accomplish this. Moyshe spends little time on family, is gone from home more and more as the danger to the community becomes clearer and the organization of resistance more necessary. But his comrades are thwarted: the upper crust rabbis insist that they have the ear of the authorities, can influence the authorities, and, if a pogrom is really coming, will be able to warn the community far enough in advance for them to be able to take action. When the rabbis finally confess their impotence, it is too late. (Daughter Sarah, too young to be a real “actor” in this period, nevertheless identifies with her brave father, against whom she measures all her actions). When the pogrom comes, the community is defenseless. Hannah uses her secret savings and connives to get the remaining family members away. And in America, at least to begin with, a role reversal takes place: Hannah becomes the family leader and the other family members assert their individuality in the context of the growing labor movement. Hannah, the traditional working-class mother, saves, haggles, bargains, coaxes in order to make ends meet. Her socialist husband hates being in America, unable to make a living, pushed by his wife to peddle fish, anything to bring in enough to pay rent. Moyshe sulks: now, when they need him, his place should be in Russia, fighting in the 1905 revolution. He rebels against being a common fish peddler: he cannot stand the individualism, the fighting for selling space, the vulnerability to goons. He finds solace when he gets work in a cigar factory, once again a wage worker, among other workers, in the workers’ movement. How can he make revolution here? Sarah, the older daughter, does what many young women must do: she quits school to work in a garment sweatshop, then takes a job in Triangle in 1909. Here she finds the beginnings of the clothing workers union movement and becomes a leader. She is fired, which only drives her deeper into the union and, when the union leadership has no interest in women leaders, she becomes part of the Women’s Trade Union League (WTUL). There she finds herself when Triangle erupts in that fire, which is the pivotal point of her life. Triangle opens up to her both the possibilities and the limitations of the trade union movement. Her association with the WTUL exposes her to the importance and the weakness of the support movement for the workers. And through these approaches Sarah goes beyond the socialist intentions of her father to embrace what will become the communist movement, which is where (in 1917) Rivington Street ends (and Union Square takes off). In the course of this turbulent decade she confronts the unwillingness of the trade union movement to recognize the leadership of women, the incapacity of the wealthy supporters of the women workers to recognize the leadership of the workers, and begins to come up against the questions of doctrine that will ultimately split the communist movement in the following two decades. These are heady times though, when thousands of workers feel their collective strength in combating their employers, when ten days can shake the world. The significance of Rivington Street is that the emphasis on these characters is their agency: how do their actions fit in with consciousness and where does that consciousness come from. Throughout this volume and the sequel the question of what is a leader/what is leadership becomes paramount. The fire and its aftermath is a vehicle for exploring this. Meredith Tax spends precious little time with the political organizations of the period – Tammany, the Democratic and Republican parties. Instead, where she does concentrate efforts it is on those organizations of the class itself – the trade union movement – and those who intend to play a role ostensibly in support of that movement. She explores the strengths and weaknesses of collective decision making throughout this process, showing, for example, the limitations that prevented the “middle class” and wealthy women supporters in the TUL from reflecting the interests of the factory workers themselves. Tax shows by this process the formation of what might be called ordinary heroes, the working class leaders who come into the struggle, contribute what they can, and stay for as long as they can contribute. The struggle itself then becomes kind of a long braid of intertwining strands of working class organizers and lives, through which the activity of one is transcended by the combined strength of all. The acted upon become the actors. The story began in Eastern Europe, on the eve of a pogrom and then a (failed) revolution against the Tsar. The story closes in 1917 as the (successful) Russian revolution occurs and the question of Zionism enters the political realities. It is a story in which Triangle is pivotal, but it is not a story about Triangle. Compare this with the novel by Katharine Weber. Weber’s Triangle is also not a novel “about” Triangle. She is adamant about this. This is a family relationship novel, made all the more poignant by the fact that the author’s own grandmother was a survivor of the fire. The central character, Esther, is the last living survivor, pursued by a disagreeable academic feminist, Ruth Zion, who interviews her as she sinks deeper into mental incapacity. Esther is in a New York nursing home, visited frequently by her physician daughter Rebecca, who teaches at Yale and lives in New Haven. The novel opens with the written account of Esther’s survival, published in a fictional ILGWU memorial to Triangle victims. Perhaps regardless of the author’s wish, the Triangle Shirtwaist Factory Fire emerges as a character in itself. Condemned to living in a reverie of memories, she is reluctant to reveal the pattern of the events her interviewer seeks. When Esther dies, Rebecca must dispose of her effects. Those effects, it turns out, include the connection to her academic interrogator and the implications that has for past as well as present. Although “Triangle” in the title certainly refers to the fire, the defining moment in the survivor’s life, it more importantly refers to the various triangular relations that have arisen in the course of the book’s passage of time. The family relationship between Rebecca, Esther, and Rebecca’s composer partner/husband to be George forms one triangle (One can argue that Rebecca is the main character in the novel). Another obvious triangle forms as George, Rebecca and Ruth engage each other in the contested terrain of the meaning of Esther’s life. The triangle that is shrouded in mystery emerges through Ruth’s interviews, and is located among the employees of the factory: Esther, the survivor; and two who did not survive, Esther’s “fiancé” and Esther’s sister. This triangle culminates in a story of sexual abuse within the “normal” working-class abuse of garment work, and some unexpected consequences. Ambiguity about the details of the frequently repeated story causes the reader to question the authenticity of the storyteller (not just her memory). Persistently, Ruth forces Esther to conjure up the fire, seeks to interview Rebecca. Her research reveals a mysterious $20,000, perhaps an incentive to distort the story. How did the criminal factory owners get acquitted? Triangle, in the final analysis, becomes the way individuals deal with societal experience. Esther’s individual experience, no less than Rebecca’s life as a physician living an unorthodox life with a Bohemian composer, determines her actions, quite isolated from or distinct from any collective decision making. In other words, victim or hero, follower or leader, the actors of this novel make their decisions themselves. That the final act of the novel is a musical composition memorial to Esther that is somehow based on the fire, on everything George has learned in the triangular relationships of the novel, is the individual decision of the artist. It may be central to the life of his mother-in-law, but incidental in a different way to George. Not entirely true that it is incidental, since he and his wife are drawn into the maelstrom of figuring out exactly who this person really was who survived Triangle. But the social context itself is subordinated to the roles that individuals play in adjusting to the consequences of the context. The question is not how can the individuals play a role in history, but how do individuals adapt to inexorable forces beyond their control. In that sense, people do become victims caught in a deterministic sequence of events, within which they have few options. In Walking Through A River of Fire, poet Julia Stein has collected a 24 poems written since shortly after the fire until last year. Published for the centenary of the fire, this poetry is fiercely partisan. Jack Hirschman writes, in his introduction, that the poems “throw a burning light on the awful working conditions the working class had to suffer under.” They do that, but they also indict a system gone awry. They paint pitiful portraits of workers about to die. They paint portraits of workers engaged in self organization. And poetry does what it does best: it opens the way for interpretation of transcendence. The best place to begin is at the beginning: not of the anthology, but with the earliest poem in the anthology. Morris Rosenfeld, one of a group of sweatshop poets, wrote a memorial to the victims that appeared on the front page of the Yiddish language daily, The Forward. The first part of the poem evokes the sorrow and anger: “See where the dead are hidden in dark corners/ Where life is choked from those who labor.” The transition from condemning the rich, the system, the world itself dissolves into the question , “Over whom should we weep first,” a not inconsequential question when viewing the more than 100 destroyed bodies on the ground before the Asch building that housed the factory. Then rousing himself, Rosenfeld addresses himself to the factory owning class: your time will come, your rule will end, the red avalanche you fear will indeed come. Walking Through A River of Fire of course speaks poems of the broken and burned bodies, but I don’t want to dwell on those. There are also the poems that speak in the voice of the criminals, Chris Llewellyn’s wonderful politician’s apology “I Am Appalled”; Mary Fell’s chilling “Industrialist’s Dream,” where a factory owner contemplates who to hire in the wake of the Triangle fire. The most telling, perhaps, of the 24 poems are three that celebrate the life of Rose Schneiderman. Llewellyn’s “Funeral For The Nameless,” Ruth Daigon’ fine portrait, “Rose Schneiderman, Union Organizer”; and Julia Stein’s poem “One of Rosie’s Girls” evokes the spirit of the organized women of the time. There is perhaps no one person who best exemplifies the heroism and leadership among women workers than Rose Schneiderman. In these poems, Schneiderman can also be seen as a metaphoric allusion to the unseen organization of workers. Remember that at the mass meeting to gather support for the families of the deceased and for the organization of the workers, held just a few days after the fire at the Metropolitan Opera house, Schneiderman was called upon to speak and, in her words, found her audience wanting. It was not Schneiderman who had passed this indictment: it was her class who indicted the wealthy who saw the poor garment workers as victims worthy of charity. Meanwhile, in the galleries and balcony seats the workers cheered their representative on stage, voicing their program to redress the problems they faced. It is that voice celebrated in the Rose Schneiderman poems. Hirschman, in his introduction to Walking Through A River of FIre, says that the Triangle fire occurred at “a certain stage of the development of the working class of the United States.” He goes on to comment on the current restrictions on immigration, implying that there are lessons in this work for us today. But what is the “stage of development” of the working class today? How does the situation in Wisconsin, indeed the entire Midwest, help us to understand that stage? The thesis of this paper concerns the role of literature in particular, art in general, in transforming class consciousness and society. A working class which is not conscious of its agency is in no position to exert power achieved. The way art is used to portray the working class is in some ways a reflection of the consciousness of the class itself. Art which portrays the class as waiting for the Rose Schneidermans of the present to appear looks at the class as essentially passive; art which portrays the workers as leaders in a collective process views social change in a distinctly different light. Emphasizing the loss of 146 victims is a disempowering phenomenon; transcending that loss to develop a collective identity and envision a future in which work itself is changed in meaning is perhaps the specific artistic content of our time. Because, the crises we face (similar fires, mining disasters, etc) come at a different stage of development of the working class. For most of the early century and a half of this country, expanding industry soaked up immigrant employment as fast as it could enter (always brutally exploited, it is true). Now we can see that industry (and associated employment) has been contracting here for decades. You can see definite signs of that contraction abroad as well. Robert Reich has recently developed a 2 minute critique of contemporary capitalism, a popular you-tube video in which he claims that the problem is that the wealth has been transferred from workers in greater and greater amounts to a smaller and smaller section of society. The instrument for doing this, he states, is taxation. Therefore, taxation of the wealthy, or lack thereof, is causing the financial straits of the states and cities. There is an element of truth in this, but were it entirely true, the crisis could be corrected by simply taxing the wealthy to redistribute the wealth. The strength of this tactic is that it focuses on the functions of a government in league with the corporate state. The weakness is that Reich aims to bring back the middle class. This argument overlooks the vast and permanent unemployment created by the new technology, which has forced capital to look elsewhere (not necessarily a geographical elsewhere) to find ways to reap profit. Reich’s vision leads to the battle to reform tax laws, bring back the old days, hope for more jobs. That would have been a possibility in the days of Triangle, which is where the wealthy socialite women who objectified the Triangle workers as victims came in. Viewing the working class through the lens of heroism today requires an art which will envision a world of work without commodities, a working class conscious of its new role in history, a twenty-first century Looking Backward, though this time looking forward with all the experience from which we have learned in the past century.